We are pleased that you have chosen us as the health care provider for your feet. Our practice is dedicated to providing quality foot and ankle care to patients of all ages. We believe that prompt diagnosis, early intervention and prevention are essential for the care and treatment of your feet. 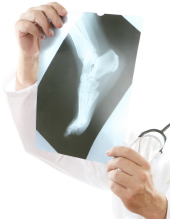 We provide a full range of podiatric medical care including both conservative care and surgery. Dr. Montoni provides the highest quality foot care to patients of all ages. We are proud to offer a state of the art Physical Therapy facility to maximize your rehabilitation process.